Check out the new trailer for Jenna Fischer‘s new biopic parody WALK HARD, written by Judd Apatow and Jake Kasdan. The stellar cast includes John C. Reilly, Kristen Wiig, Paul Rudd, Jack White and many more. And for you OFFICE fans, expect a few familiar faces to appear – Ed Helms and Craig Robinson also have roles in the film. America loves Cox! 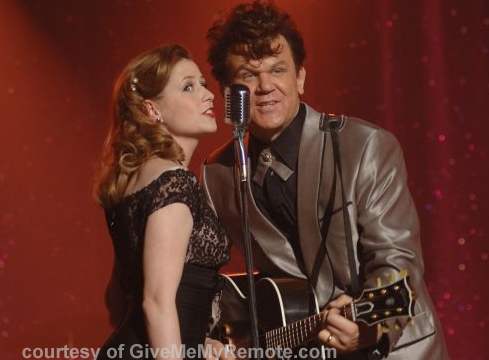 But behind the music is the up-and-down-and-up-again story of Dewey Cox (John C. Reilly), a musician whose songs would change a nation. On his rock ‘n roll spiral, Cox sleeps with 411 women, marries three times, has 22 kids and 14 stepkids, stars in his own 70s TV show, collects friends ranging from Elvis to the Beatles to a chimp, and gets addicted to – and then kicks – every drug known to man… but despite it all, Cox grows into a national icon and eventually earns the love of a good woman – longtime backup singer Darlene (Jenna Fischer). Jenna looks absolutely stunning in this movie, and I can’t wait to see it when it hits theaters on December 21, 2007. Jenna looks great, and seriously, Paul Rudd as John Lennon? YES. Jenna Fischer, Jack White and Paul Rudd in one movie? I can die happy. I had to do a double take, that doesn’t look like Jenna! But, she is super georgeous. I love it. Can you imagine what Jim would do if Pam showed up looking like that? I love the movie Walk the Line and I also love Judd Apatow movies, so this looks quite awesome! It’s too bad though that Jenna didn’t end up doing her own singing. It took him around 10 + 30 years to get to the level he is at currently. As a result, actors depend on a believable set, costume, location and make up to support their actions.